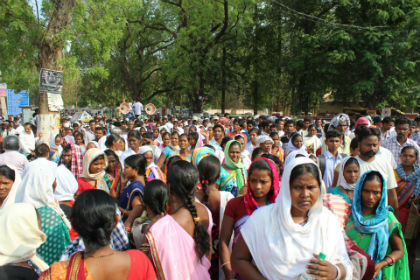 Sundargarh: Thousands of tribals coming across the district today organized a public meeting at Bhawani playground ,marched in a protest rally around the Sundargarh city and gheroaed the district Collector office demanding implementation of 5th Scheduled, PESA Act 1996 and FRA, 2006 under the banner of Adivasi Mulniwasi Adhikar Surakshya Manch(AMASM) and Adivasi Mulabsi Bachao Manch, Sundargah(AMBM). They gave slogan like “Gram Sabha Sarkar Zindabad”, “Hamara Gaaon me Ham Sarkar”, “Jo Jamin Sarkari Hai Wo Zamin Hamari Hai”, “Ladenge Zitenge” etc. Anil Ekka, young president of (AMASM) said “Hon’able Governor is all in all in the scheduled district and his superior is the Hon’ble President of India who is responsible for all the administration of the Scheduled 5th area and there is no role of Chief Minister of a State. All the land, forest, water and natural resources belong to us but the State Government along with the greedy bureaucrats and corporates determined to loot them pushing us towards starvation and depriving us from our own land. But now it won’t be so easier. We become aware of it and save our land giving our life if it is required.” He also targets the existing Panchayatiraj system and called upon the people to discard it and to establish PESA and FRA Gram Sabha in every village and to exercise the power of Gram Sabha in the coming days. 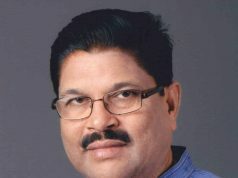 Sri Prafulla Majhi, MLA of Talsara questioned on the poor implementation of Forest Rights Act,2006 in the district even after 12 years of its enactment. 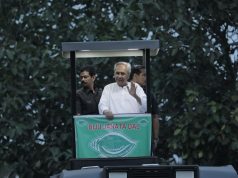 Targeting the ruling BJD Govt. he said, “the State Govt. has totally failed implement the Act in its true spirit resulting no community rights has been recognized in the district. While the FRA empowers the gram sabha, the district administrators has usurped upon the power of gram sabha and mislead the community. Hand in gloves with the Companies, the district administration have illegally cancelled whatever Individual forest rights titles issued to the tribals in the coal mines areas of Hemgiri Tahasli depriving from their genuine rights. “While no Gram Sabha has given any written consent with 50 per cent quorum as happened in Niyamgiri case for the diversion of forest land for NTPC and OPGC/OCPL, MCL coal mines, how these companies have got forest clearance, environment clearance etc.” He alleged. Tribal Leader, Letha Tircky highlighting the progressive provisions of PESA Act and FRA, 2006, said “It is unfortunate that even after passing of 21 years of the central PESA, Act in 1996, the Central Govt. has failed to implement the act in the ground now what can be expected after Modi led BJP is in the Central Govt.” he doubted.” “The Govt. is totally blind towards the history Supreme Court’s Judgments i.e., Samata in 1997, Jagpalsingh vs Govt. of Punjab in 2011 and historic Niyamgiri judgment in 2013.” He said. Tribal leader Sipriyan Kindo citing the Supreme Court observation said “Neither the Lok Sabha nor the Rajya Sabha, Gram Sabha is above all” and based on this we have lunched “Patthar Gadi” campaign in all the villages which is based on PESA Act and Govt. should not fear of it. He further alerted the administration to refrained from disturbing it. It is to be noted that Sundargah district is a fully a scheduled 5th district with full of natural resources including mineral resources and from last five years Adivasi Mulniwasi Adhikar Surakshya Manch(AMASM) and Adivasi Mulabsi Bachao Manch, Sundargah(AMBM) protesting against the anti-PESA and anti-FRA policy of the Govt. Despite Sundagrah bandh called today by Citizen Forum against hike in toll gate fees, the huge gathering clearing pointing out the serious dissatisfaction amongsts the tribals of Sundargarh. At the end of the protest march, they gheaored the collector office for long 3 hours and submitted 18 pages memorandums to the Governor marking a copy to the president of India. A 12 member’s delegation from AMASM and (AMBM) met and discussed on their demands with the district Collector. The district Collecotr has assued the Tribals to resolve the issued raisedinthe public meetingb. Among others Dillip Lehari, Patrash Ekka, Haran Bage, Arthar Soren, Sushil Lakra and others addressed the huge gathering.